There are more and more concepts of individual eco cars – prototypes of the cars of the future – appear every year. 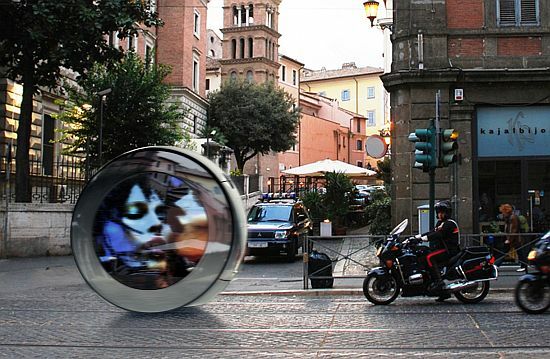 Today’s concept – a futuristic creation of Russian designer Vitaly Kononov – is called "Rolling Stone". A very accurate title for the vehicle having so fantastic design. 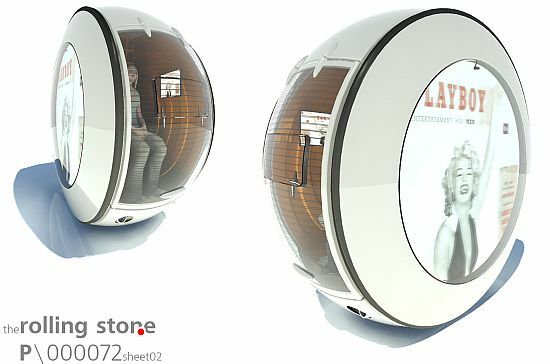 The corp of the car consists of two large wheels on each side of the capsule housing the only passenger. The car moves through the electric motors receiving power from onboard batteries. The design of concept is intersting by itself – both sides of the concept car are LED screens on which the pilot can show any photo or video. Such concept car looks amazingly nice but its practical side is more doubtful. And you can always check other concept cars: 15 Best Concept Cars. vehicles in which the rider sits within a large wheel are uncommon for a reason. their instability makes them impractical at best. Now, such a vehicle with only one wheel could make a viable motorcycle replacement. however, adding a second wheel parallel to the first, as opposed to in front of or behind it, means that the vehicle can no longer corner properly, and even if that was rectified by allowing the wheels to tilt without their bases leaving the same plane, the vehicle would still be extremely prone to tipping over. What if it goes down while taking turn? ?